You have already booked the tickets, you have planned everything, but it seems like packing is the most challenging part so far. 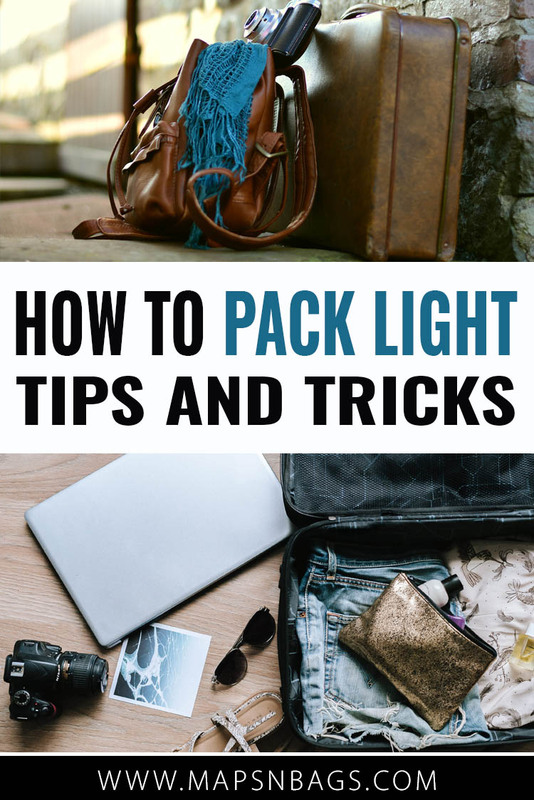 How to pack light? This question comes up quite often in my mailbox, and I have to admit that I struggled with it in the beginning too. 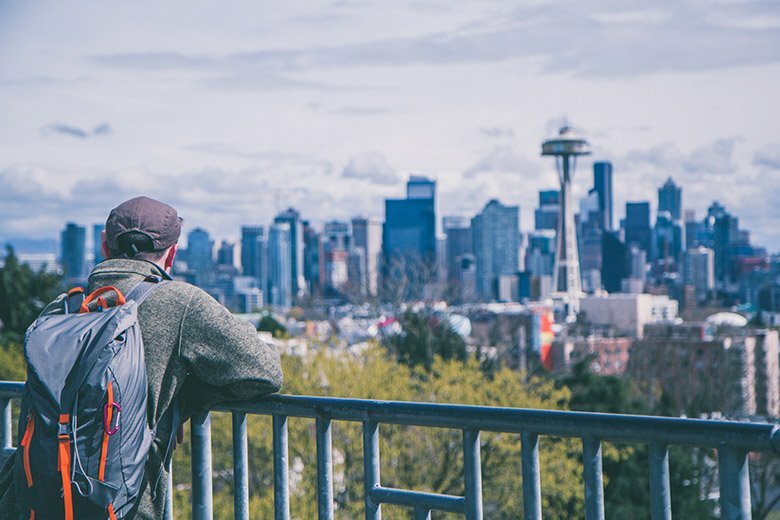 It took me a whole year carrying a heavy backpack around nine countries to realize that I needed to learn how to pack light and how to optimize the capacity of my carry-on bag. Better late than never, here I am to share what I have learned the hard way, together with many tips so you can master the art of packing for men and women! This post is not supposed to be a packing list, but an explanation of why you need to pack light and what you should pay attention to. But don’t worry, I’ll release my packing list for you in a couple of weeks. Promise to put the link here! It’s cheaper: at first, you’ll spend more to buy the gears you need – like a backpack, washing bag, etc. – but later you’ll realize it pays off. Big time! Why? Because you save money by not having to check in a bag, nor having to buy tickets from an expensive airline. Also, you can’t purchase many clothes to travel because they won’t fit in your carry-on anyway (carry-on sizes chart). Only benefits here! It’s easier: having only a few options of clothes helps us to make easier decisions when it comes to what to wear at a destination. Besides the fact that you just have to take care of one backpack or suitcase, no more backpack, and a purse and a suitcase for four days in Paris. It’s lighter: I’m stating the obvious, I know. 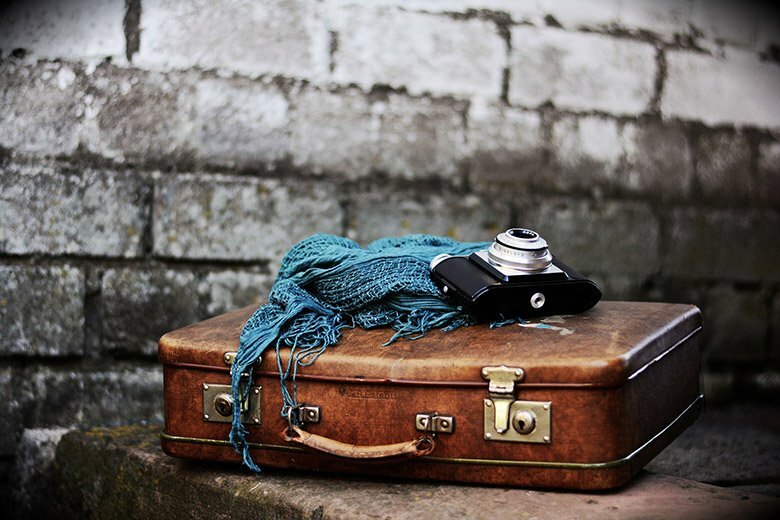 But what many people don’t realize is that traveling is tiring and when you don’t pack light, your body suffers a lot! Then the energy you’d spend to explore the place, you spend on trying to recover from the commute. It’s faster: it is! How? Well, when you’re late and have to run to catch a flight – running with a carry-on only makes the whole difference! When you pack at the last minute as we all do. When you unpack after your vacation, and you’re super tired, but have to do it. Pssst: Organize your trip with our FREE travel planner! Subscribe to Maps ‘N Bags newsletter and get access to our private library jam-packed with this and other freebies. Subscribe! What kind of trip is it? Beach vacation? Then luckily, you don’t need many clothes and shoes (as a matter of fact I wrote a packing list for Brazil). But wait, you’re hiking 10km every day in some mountain in China? Hiking boots are a must then. 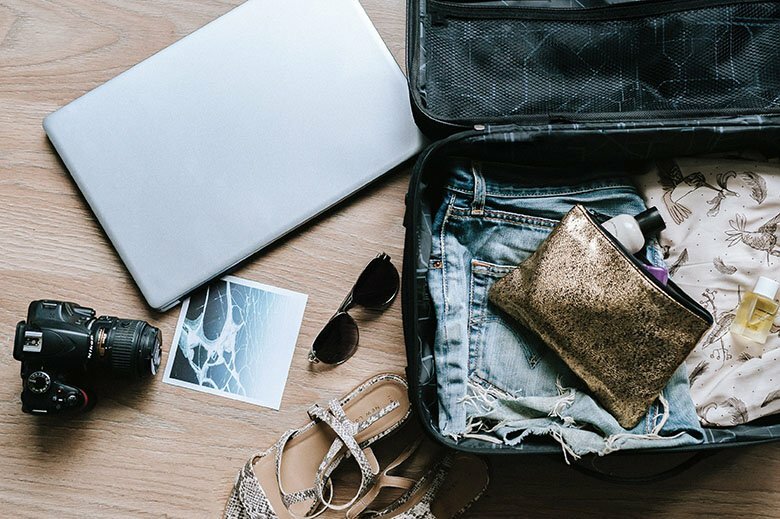 You have to determine what kind of vacation you’re going and based on your wishes you’ll be able to apply these tips to your packing list. And remember: always wear the heaviest while traveling! It saves space in your backpack! You might want to take a look in the concept of capsule wardrobe when packing. It’s a minimalist collection of a few essential and interchangeable items of clothing that don’t go out of fashion. Which means you’ll have many outfits with a few pieces of clothes. And that’s the principle of packing light, right? A very used term on Pinterest, when we apply this to travel, we don’t necessarily have highly-fashion outfits, but it means we have essential items that look good with anything, so they also look good together. I’ll talk more about it later in the text. Travel capsule and minimalist wardrobes might sound like the same, but they’re quite different from each other. 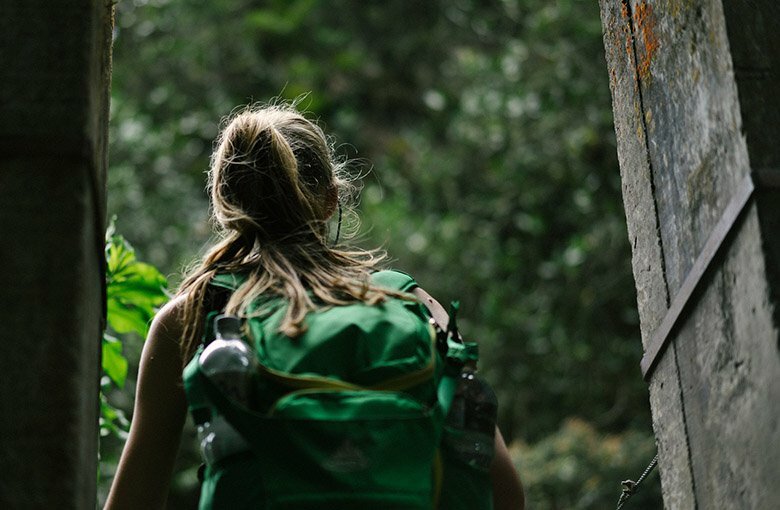 Minimalist refers to travel with the minimum you need to survive. It also uses the main idea of a travel wardrobe, but it goes a bit further. How? Well, you could pack three or four t-shirts, two pairs of pants, one pair of shorts, one skirt, and one dress. These items are enough for a week, and they’re not heavy to carry around. However, if you want to have a minimalist packing list, you might consider cutting it by half. But what do you do when you need to wash your clothes? Send them to the laundry? Nope. The point here is to travel smart, so you give more money away then you need to. Instead, buy a travel washing bag and wash your clothes yourself. It doesn’t take much space in your backpack, and it will last for many vacations to come. Since you’re wearing your clothes more than once, it’s also important to keep them fresh. You can do this in a few different ways, like hanging them for a couple of hours instead of folding them back to your backpack, or packing a stain remover like Tide to go. You can also use dryer sheets in your packing cubes to keep your clothes smelling fresh and nice. Since I’m talking about it, these cubes I mentioned are life-savers! Packing cubes not only organize your baggage, but they save loads of space. I have one for underwear, one for bottom clothes, one for tops and one for electronics/ cables. Whenever I need something, I know exactly where to find it, and I can just get it without ruining everything that I organized. My packing and unpacking moments have become seriously easier ever since. If you follow these tips, you will maximize the usage of your clothes during your trip and bring way less stuff with you. When you choose your clothes to travel, you want to pack low-maintenance and versatile fabrics. This is the key to pack light! The perfect travel clothing is of good quality, takes up minimal space, and is weightless. Pick materials that fold up small, create the least wrinkles as possible, dry quickly, and match the rest of your clothes. Polyester and Nylon are lightweight, breathable, and dry pretty quickly. The downside is that they’re not so soft on the skin like cotton. Cotton is breathable, but it doesn’t dry as fast as the previous two kinds of fabric. Some clothes are a cotton/ polyester blend which finds a balance between softness and how quickly it dries. Merino wool socks don’t necessarily need to be washed after every use. Often, letting it to air dry overnight will do the trick. This is a perfect item to pack light that can be worn for 2-3 days, and it prevents blisters, and it absorbs around 30% of its weight in water. The downside of it is that it can take a little longer to completely dry and it’s more expensive than other materials. I’ll say this a few times, but it’s something that I truly believe and do myself, “buy good stuff, so you buy less stuff.” Always go for good quality and durable clothes. This way you won’t need to purchase new clothing every time you travel somewhere. Pick neutral and dark colors. They will match most of your clothes, following the travel capsule wardrobe concept I mentioned above, and hide stains and wrinkles better. Also, planning your outfit for every day will drive you crazy! Instead, pack only clothes that look good together and not a complete outfit. Like a black cardigan, a skirt, your favorite jeans, a white, gray, and a red top for a week in Paris. Jeans can be worn a few times and tops require much less luggage capacity. The rule here is to pack for a week, no matter how long you’ll be on the road. Pro tip: choose multifunctional clothes! A sarong is the most useful item I’ve ever seen in my life! You can use it as a privacy curtain, towel, blanket in a chilly flight, pillow, picnic blanket, cover-up for beach and churches, shawl, beach mat, apron, scarf, head scarf, keffiyeh; you name it! Warm destination? Don’t forget long-sleeves to protect against sunburn. Cold destination? Layers! Take one good coat with you and many thin but warm layers. Packing for winter vacations can be a little bit tricky because it requires much more capacity, but it’s not impossible. After you have chosen your clothes, lay them all on your bed so you can see them together. Not sure whether or not you’ll use something? Leave it then! Seriously, only pack must-have clothes, not ‘just-in-case’ clothes. 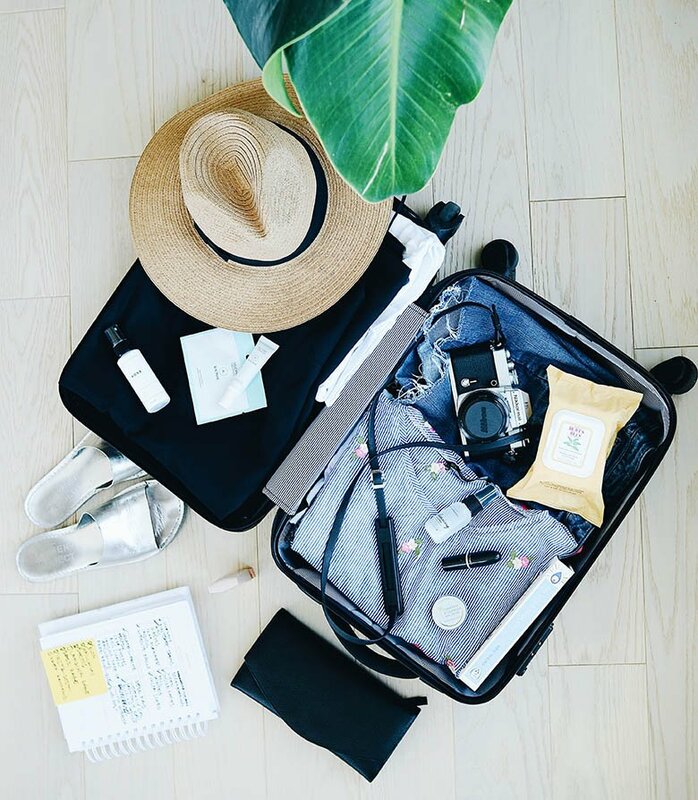 There a few things that you should not pack for your trip, like high heels, a lot of flats, hiking boots when you’re not going to hike for real, and new shoes, among others. These items take a lot of space in your backpack, and they can be heavy. Such a shame, right? So, what I always do is to pack my running shoes to walk the whole day (if it’s scorching weather I pack my Teva sandals instead), one pair of foldable flats to go to a nice bar at night, and Havaianas flips flops to rest my feet. That is it! Don’t bring toiletries you can buy at your destination, like shampoo, soap, etc. But if you do, choose those small silicon refill bottles. Why silicon? Because then you will have something durable that you won’t have to throw away after a couple of uses. 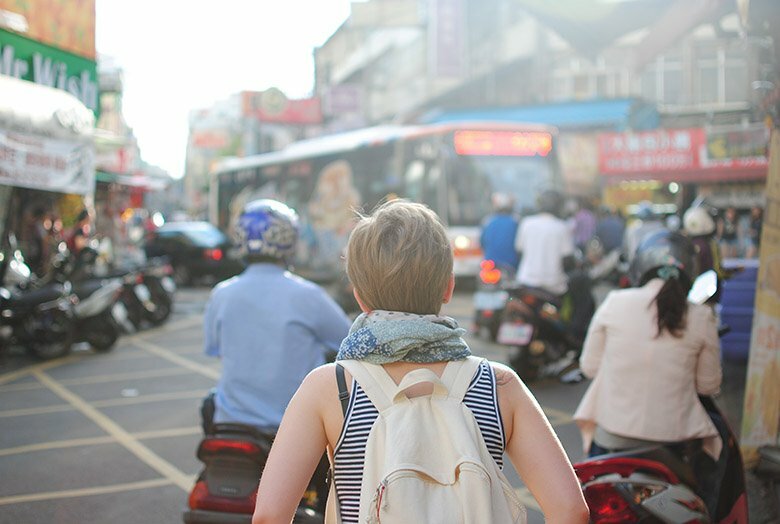 For female travelers, don’t buy tampons which aren’t good for the environment and your wallet, instead buy one menstrual cup and enjoy the freedom it offers! It’s a life changer, seriously! And if you can’t live without makeup opt for solid or powder versions. Avoid packing too many liquids or aerosol bottles in your carry-on (up to 100ml/ 3,4oz), or you’ll have your things confiscated. Finally, put all the fluids from your carry-on bag in a transparent bag to facilitate the screening process at the airport. Pssst: Many people ask me if drones are allowed through the checkpoint and to clarify this point: they are! Although you have to check your airline’s policy if drones are allowed in the cabin. Only pack what is necessary. No need to bring all your electronics for a vacation trip. Instead of the laptop, bring a tablet. Instead of a heavy book, bring a kindle with many e-books. Want to transfer the photos from your camera? Check in advance if you can transfer them to your smartphone using an app, or just buy another (tiny) SD card. Whatever electronics you pack, always bring them in your carry-on bag for safety reasons. Besides, if it gets stolen from the checked-in baggage, the travel insurance won’t cover it. Choose your bag, suitcase, backpack, whatever you prefer, but choose a decent and good one to carry your things. Don’t try to save money here. Remember: you should buy good stuff, so you buy less stuff. Trust me; it’s worth the investment. Plenty of readers ask me what the lightest carry on luggage is and the one I recommend, together with many fellow bloggers, is the Osprey Farpoint 40L. This bag is padded in the shoulder straps, a treat to your shoulder after a long day traveling, and it’s a high-quality, lightweight travel backpack. It also has a large internal compartment and if you follow the tips above you’ll be perfectly fine for a 3-5 weeks backpack. Even more, if you adhere to the minimalist travel packing style. But if you still need something more significant, take a look at its bigger sister Farpoint 55L instead. Now, pack everything into your backpack and walk around your house with it to check if it’s too heavy. If it is heavy, this is the right moment to remove a few items. Check your airline baggage policy to make sure your bags aren’t too big or too heavy. For checked-in baggage the weight limit is usually 23 kgs./ 50 lbs., for carry-on bags is 8kgs/ 17 lbs., and for the personal item is 2 kgs./ 4,4lbs. To weigh your suitcase, you can use a portable scale. 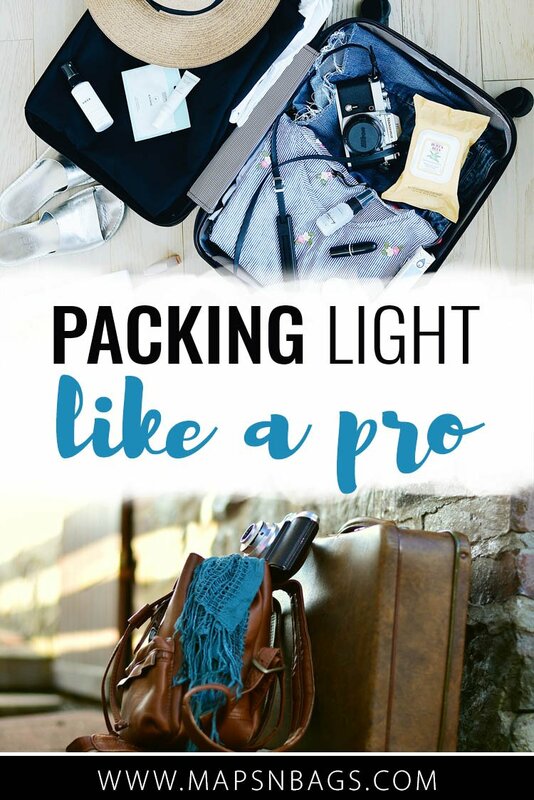 Do you have some tips and tricks to share with us on packing light? Drop your suggestions in the comments! Did you like this post? Then pin it to your Pinterest travel board! This entry was posted in Packing Tips and tagged slider. Those benefits ring so true with me Bruna. I began circling the globe with a BIG suitcase filled to the brim LOL. Now I travel with a small suitcase maybe half filled. I do lots of laundry and carry little because it is easy, and less stressful, and helps me get around quickly. Like your benefits lay out. Go light or bother not traveling I say. Excellent post. I swear by packing cubes but have never considered a capsule wardrobe – what a great idea!! 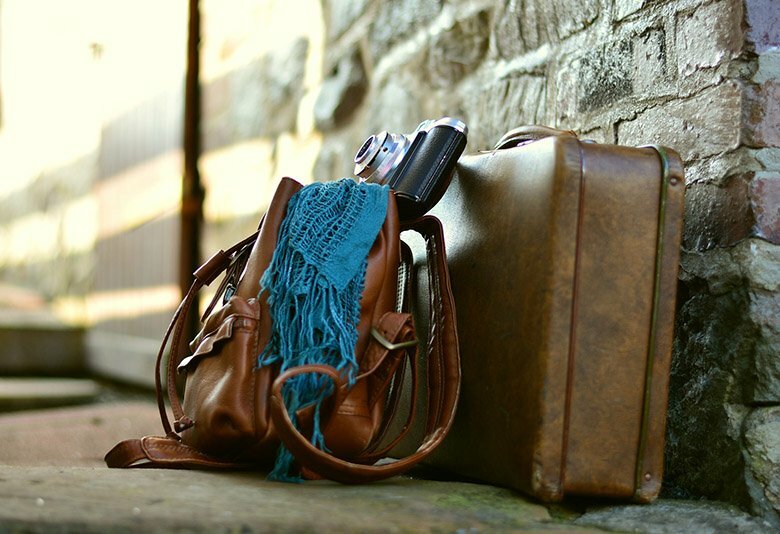 Definitely need these tips as I leave in two weeks for a 9 month trip eek! !